Jacquelyn Nicholson (@JacqNicholson) is the Enterprise Sales Director at Percolate, a content marketing platform built for some of the world’s largest brands. She’s also an active Inner Circle Member at Leadership X University, a high-level mastermind group of leaders who demand excellence in business and life. Jacquelyn’s interest in sales was sparked by a non-sales position she held at Johnson & Johnson (J&J) back in the pre-internet era. Reporting directly to the VP, she had the opportunity to introduce the CFOs and CIOs of different J&J operating companies to the idea of moving their business online. This role offered a unique experience “selling” directly to senior executives. 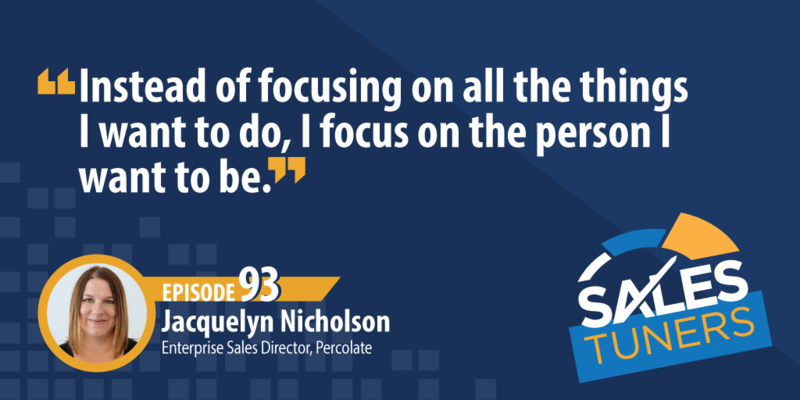 Now, more than two decades of sales experience later, Jacquelyn explains how self-evaluation and learning to focus on the right things are the secret to success. It’s so easy to get lost in what we want to do. Instead, Jacquelyn recommends focusing on the person you want to be. This understanding of who she wants to be is directly reflected in how she views her role as a salesperson. For her, sales professionals are here to serve other people, solve problems and make the lives of prospects better. Executives are Like Everyone Else: Having senior level conversations is no different than conversations with anyone else, they just want you to get to the point a bit quicker. They want to know specifically why what you’re bringing them is important to them and what value it will add. The best way to show this value is to start with the why behind it. Research Matters in the Enterprise: We’ve talked a lot on this show about how much you should research before you start an outbound initiative, but in the enterprise, it’s imperative. You need to know not only the industry challenges but also specifically the business priorities of the individual company you’re trying to get into. If they’re public, read their investor documents and regulatory filings. If they’re private search for any presentations they have online or try to find who their investors are and research their investment thesis to open up the critical components of a conversation. The Only Thing You Can Control is You: While you can’t control every situation you find yourself in, you can absolutely affect the outcome. The only unknown variable is your reaction and/or your response to the situation. If you look around and blame everyone else for your predicament, realize you’re giving up all of your power. Our biggest problem looks at us every day in the mirror and we must stay true to who it is we aspire to be.